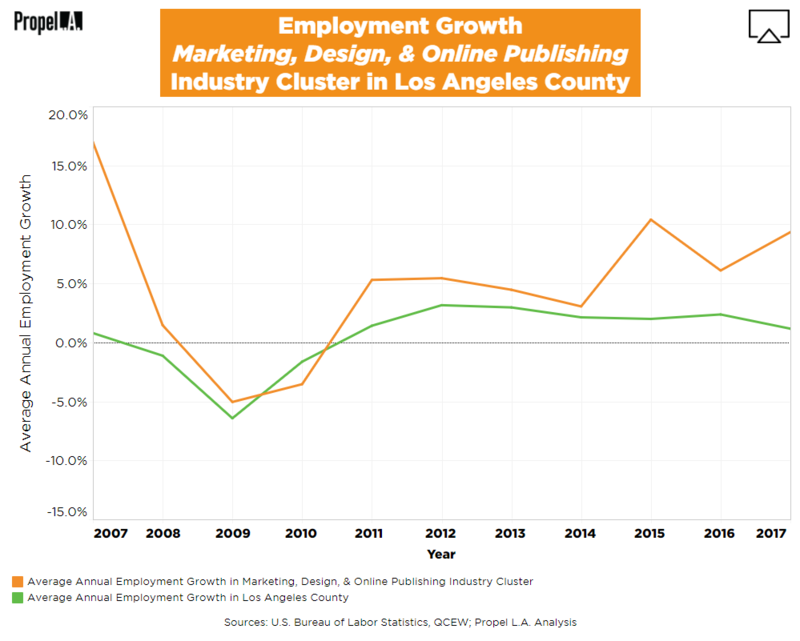 Employment Growth of Marketing, Design, & Online Publishing Industry Cluster | Propel L.A. The Los Angeles County’s Marketing, Design, and Online Publishing (“MDOP”) experienced a drop in employment growth during the Great Recession but since then experienced significant gains. Between 2011 and 2017, employment grew at an average rate of 6.3% per year. For comparison, the green line represents the average employment growth of the whole county, irrespective of industries or clusters. Any rate below 0%, even if greater than the previous year, still indicates a decline in employment. Several factors contribute to the sustainable employment growth of the MDOP industry cluster in Los Angeles County. As popularity in internet marketing soars via social media and search engine optimization, companies require more employees who specialize in this area (The Drum, November 2017). In addition, while some ad reliant jobs are being replaced, other historic publishing giants have managed to stay relevant. For example, the newspaper industry has actually grown in its number of employees due to consumers’ preference for the lack of clickbait and ads in newspapers (Techcrunch, March 2017; Forbes, January 2017). This growth is supported by Nasdaq investors as well, who believes newspaper digitization will continue to carry on smoothly (July 2018). Annual employment growth was calculated by dividing the change in number of employees between two consecutive years by the number of employees in the preceding year within all he selected NAICS industries. Calculations only account for private ownership. NAICS industries were selected by using the definition of the industry cluster produced by the Cluster Mapping Project (CMP) developed by the Harvard Business School. Due to large population size of NAICS industries in the Hospitality cluster, Propel L.A. selected five through random sampling to represent this particular cluster. The summary of results may be slightly biased due to the NAICS industries being nonexhaustive. To learn what the Marketing, Design, and Online Publishing industry cluster or an industry cluster is, read here.